To start with maybe you’d like to slow things down then you don’t need to venture too far. Have a meander around our mature garden grounds – you can wander up to the woodland (In late Spring wild garlic and bluebells abound) or down to the River Tay itself. Be prepared to enjoy an abundance of wildlife right on our doorstep. Take your time and enjoy! 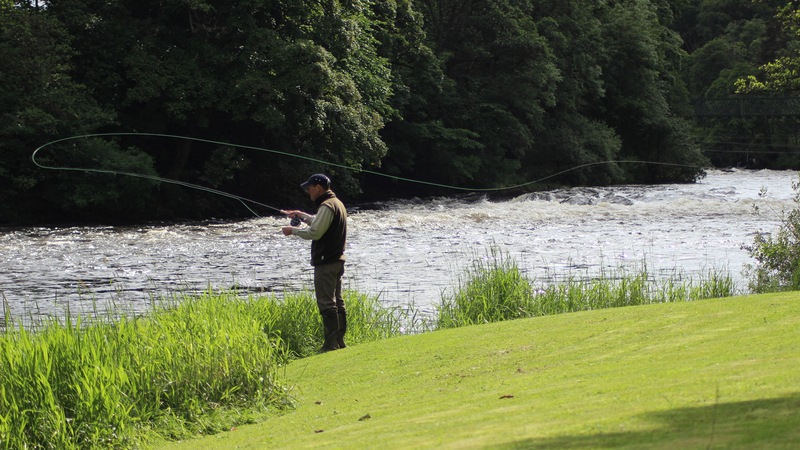 Here we have a golf course with complimentary golf for our guests and for the fly fisherman you can come prepared to enjoy free brown trout fishing on our own riverside bank. Within a few minutes’ walk from Riverwood you can explore the twin villages of Strathtay and Grandtully. We have a well-stocked village shop and across the river they serve a delightful coffee in the Chocolate Lounge at Iain Burnett, the award-winning Highland Chocolatier. Why not partake in a refreshment at the Inn on the Tay? Pitlochry, Aberfeldy and Dunkeld are all within 15 minutes’ drive, and as for eating out, our guests report back where they have had the best experiences for eating out and we simply listen, ensure we continually update ‘the best ones’ list and pass it on.